Submitted photo Imogene Dice was named 2018 Senior Citizen of the Year at the 42nd Annual Dr. Clement Austria Christmas Party. She is shown with Xenia Mayor Sarah Mays. 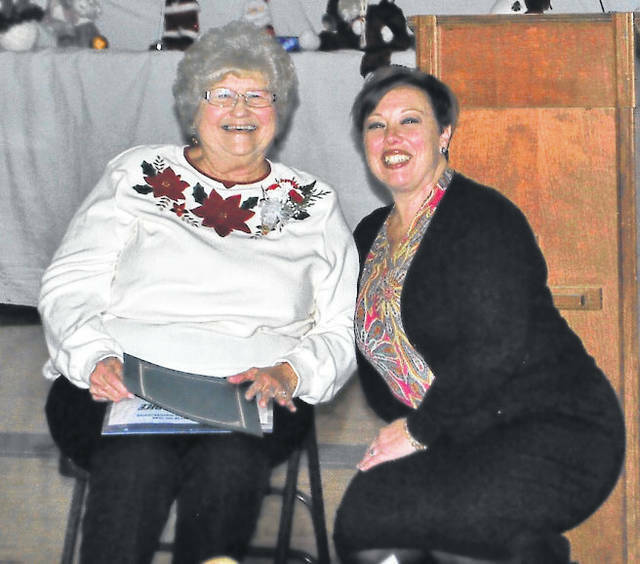 XENIA — Imogene Dice was named 2018 Senior Citizen of the Year at the 42nd Annual Dr. Clement Austria Christmas Party held Dec. 3 by the Xenia Adult Recreation and Services Center and the Austria Family. Mayor Sarah Mays honored Dice by declaring the day as Imogene Dice Day in the City of Xenia. Imy, as she is affectionately called, was recognized for this award based on her unending support to the senior center and the members it serves. She has stepped up to many challenges through the year to help the membership with fundraisers, one of which is its candy sales. Hundreds, maybe even thousands, of people have tasted Dice’s homemade peanut butter fudge. She has put her heart and soul, and a lot of sugar, into making this treat that has been one of the best candy sellers this year. Dice has worked tirelessly for this effort and never once complained when asked to restock because her fudge had sold out again. Aside from her tremendous support on the recent fundraiser, Dice has been a volunteer in the center’s office the entire year. She has a regular schedule but also is quick to fill in whenever the secretary needs her. As might be expected, she rarely includes the word “no” in her vocabulary. https://www.xeniagazette.com/wp-content/uploads/sites/32/2018/12/web1_Dice.jpgSubmitted photo Imogene Dice was named 2018 Senior Citizen of the Year at the 42nd Annual Dr. Clement Austria Christmas Party. She is shown with Xenia Mayor Sarah Mays.